Thanks! Out of all my foodie friends, I knew you would love these! Happy Halloween! Those are just adorable!! My girls would absolutely love those!! Thanks for sharing and welcome to foodbuzz! Absolutely adorable! I was trying to think of a few fun activities to do with my kids this weekend and think I’ve found a winner. They will too have the M&M issue, but it will be a good trial for Trick or Treating tomorrow to be unable to eat everything they are given! Thanks for the recipe, love the pictures. Wish I had seen this 2 days ago!!! These are absolutely adorable. Will definitely be saving for next year! 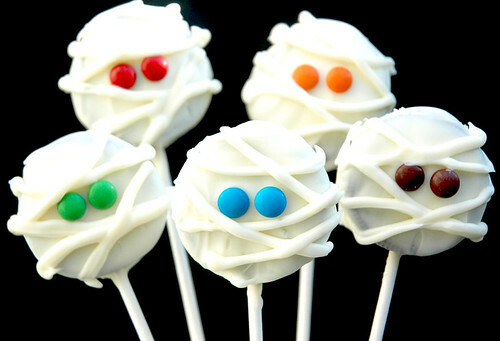 Cute little mummies! I love the rainbow of eye colors. very cute! perfect for halloween. These are adorable and so simple! I’ll have to remember this for next year!